What's making you constipated? If you are on a diet, the cause of your constipation may be one of these. Treat yourself by reforming you diet at home. The causes of constipation are many. However, that doesn't mean that some are not diet related. Fixing your diet avoiding extreme calorie cutting, getting enough balanced nutrition, and finding a vent for stress may be what you need to stop being constipation in no time. 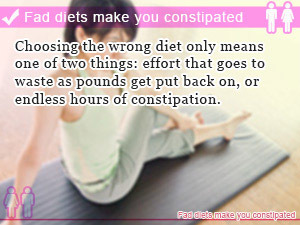 There are many reasons why people get constipated whether you are on a diet or not the results seem to be the same. In particular constipation in women tends to be influenced by thehormone balance. This indicates that something can be done by taking care in your diet by watching what foods you eat. You would be surprised how constipation affects your diet. Constipation is not only painful, diet related cause skin irritation and a poor metabolism, would also adversely affect diet also beauty. The diet for becoming beautiful makes skin tatter, and making the constitution in which it is hard to become skinny even has it. Let's check the cause of constipation peculiar to a diet and use for constipation prevention and an improvement also for a diet success. In this Slism, why constipation is an issue while on a diet informing you of the what sort of diet to avoid to prevent constipation and give advice on how long it take to get rid of constipation. There are many reasons why adults get weighed down with constipation during diet and exercise. In particular, people who have experience constipation after jumping into a new diet may have been trying to cut back too much becoming overwhelmed with stress forgetting the importance of balance in your diet. If there are also many people who are without knowing the cause of constipation of themes, such as "eating many vegetables ....", "fully take moisture ....", and "exercising firmly ----." If you do not deal with them to meet their own diet related causes of constipation, constipation is not resolved as well? First of all, it would be important to find the cause of the constipation. Please check out the main causes of constipation in the diet. Are there any that apply to you? Sharp cuts in your daily food intake combined with a decrease in dietary fiber can cause constipation. That's why it is important to gradually reduce the amount of food you eat if what you are looking to do is reduce calories by eating less. Taking is slow is a sure recipe to avoid constipation and other diet related issues. Although there is a person of "being constipated reducing the quantity of the meal, however eating food good for constipation of a vegetable, yogurt, seaweed, etc. ", however it may take in food good for constipation, it will be constipated if there is too little quantity of a meal. If there is too little quantity of a meal, intestines reflection (work of the intestines for defecation which happen because food etc. goes into intestines) will become difficult to take place. Not getting enough fat in your diet for dieters in particular may be the main reason that you get constipated in the first place. At first, what seemed like innocent cut backs in fat consumption taking shortcut in your diet is actually a big no-no for anyone not wanting to have to deal with the discomfort that goes along with constipation. It can be said that "Lipid is a powerful enemy for dieter" Therefore, it is not the thing "which you do not need to consume"
During a diet, although it is lipid to cut down if possible, it is one of the three major nutrients, and is an ingredient indispensable to life support. Fatty acids contained in the lipids, since the effect of promoting serves to stimulate the intestine, I must be moderately fat intake for a normal bowel movement. Stress while dieting is real! In fact not being able to cope with the stress of dieting is the main reason why many give up on their dreams of losing weight entering into the downward spiral known as gaining weight. To make a point, give yourself a break to feel like you are in total charge, not following everything that book you started reading that dictates you every move saying, "Don't eat that." The pain of being hungry dealing with weight issues can be horrifying. Isn't it painful feeling of hunger due to dietary restrictions!? Why not some people are having experience that will not withstand the frustrating feeling of hunger, frustration, failed diet? Stress and the munchies are not something that you should let come together. Not eating causes you to become stress. Binge eating satisfying your primal hunger need causes more stress after getting your feet back on the floor. The stress by these munchies may cause constipation. Stress, would disturb the balance of the autonomic nervous system. Maintenance of body temperature and sweating, respiration, and metabolism, autonomic nervous because they play an important role in the control of life on the go, stress would adversely affect the various functions of the body. Because it is controlled by the autonomic nervous system also serves the intestine, function of the autonomic nervous system is disturbed by stress, and it becomes even worse intestinal function. Dietary restriction to the extent that irritation is felt and movement which becomes a burden will be stress, and will cause constipation. Let's keep in mind the drastic diet which is not. When you don't get enough balance in your diet there runs the risk of sending your body into ketosis which inefficiently dips into your fat stores sending your body into survival mode, which is said to be hard to rebound from especially when trying to maintain weight. What happens when you go on apple diet? Nutritional balance is a fragile thing. Even as single item diets such as the apple diet to consume only a certain food are prone to constipation. It does not even matter how nutritious foods that should only eat their food. That is to say that balanced diet contains many parts working towards the whole. If a well-balanced nutrition, you will need to consume a lot of food. Keep in mind the balance of your diet while planning your meals. If in diet, but they just calorie conscious, we try to be as aware of the nutritional value of the food as well. Typically one should expect to get rid of constipation in about 3 dayswithout relying on medication. Although taking medication to get rid of constipation helps get it out that doesn't mean that the constipation is gone. In the worst, case you develop a dependence on the medicine you are taking making the matter worst. That is why even when taking medication you should give it a few days to go away making the necessary adjustments in your diet to get back up to tip top shape. It turns out there a lot of thing you can do to relieve constipation such floor exercises to treat constipation that may speed up the healing process. Although it is ideal that there is a bowel movement, but does not say to medicine with the constipation every day even if it is the bowel movement once in three days without relying, and feeling pain if I can empty the bowels by one's power. In addition, it may be said that it is constipation if I feel pain even if there is a bowel movement every day. If bowels can be performed pleasantly, and it becomes about one time on the 3rd, it will not be necessary to care. Although it is not good to care about not coming out too much, it is also a problem that cannot be grasped "How many days it has not come out!?" and how many days he will not have defecation on the contrary. It will be necessary for the person who is apt to be constipated to know the situation of one's bowel movement. 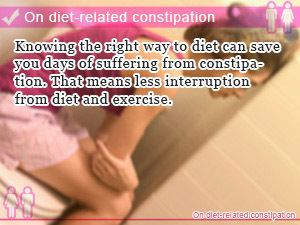 Knowing the right way to diet can save you days of suffering from constipation. That means less interruption from diet and exercise. Choosing the wrong diet only means one of two things: effort that goes to waste as pounds get put back on, or endless hours of constipation. Read a book. There are no fast ways to instantly treat constipation. However, there are ways to speed up the process.